Everyone wants to know how their company stacks up, especially HR. With unemployment at historic lows, the race to attract and retain talent has never been more competitive. Looking for an edge? 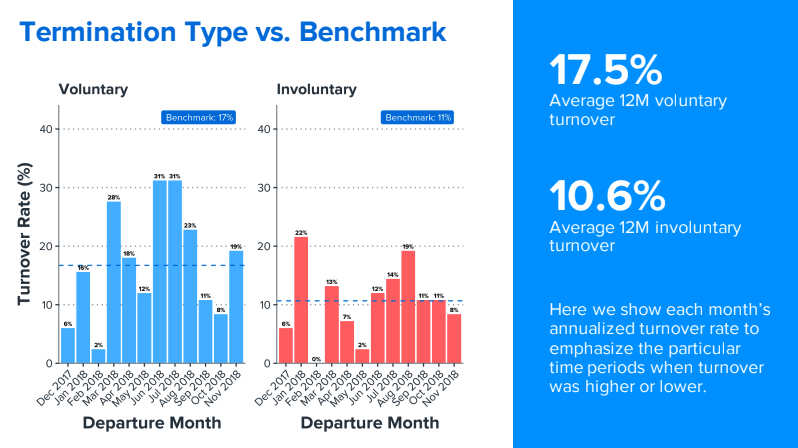 The Namely team is thrilled to announce our new Benchmarking Package, empowering you to gain deeper insight into employee turnover, internal mobility, diversity, and more—all presented alongside data from companies just like yours. As part of the offering, Namely clients receive a tailor-made quarterly report on the state of their business. Want to repurpose the quarterly report for your next board presentation? That’s the idea. It’s like having an entire team of data scientists at your disposal, even if you’re just an HR team of one. HR teams have always wanted comparative data—but up until recently, fulfilling that need hasn’t been easy. Why? Take something as seemingly straightforward as employee terminations. We all know the difference between voluntary and involuntary departures. But what’s the difference between one company’s “lack of career opportunities” and another’s “lack of growth opportunities?” In the past, subtle nuances like these made it logistically challenging to glean industry-wide insights from custom fields. With the help of machine learning, Namely’s platform can now scan, interpret, and consolidate hundreds of thousands of unique lines of data. The result? A list of 32 definitive termination reasons covering every situation, for example. That means companies can clearly understand why employees are leaving, and whether those reasons are typical for their industry or company size. That’s just one example of how machine learning has made it possible for Namely’s Benchmarking Package to identify industry-wide benchmarks. The leading cause of employee dissatisfaction at mid-sized technology companies is lack of role clarity. Across all company sizes, teams led by managers with 8-10 direct reports had the lowest turnover rates. “Ghosting,” or when employees up and leave without a trace, is on the rise. Our data shows that job abandonment has doubled since 2017. That’s just a sampling of what we’ve found. Equipped with Namely Analytics and the Benchmarking Package, we’re thrilled to see what other data discoveries our clients will make for their own workplaces. The Benchmarking Package is now available to all Namely clients. To see the offering for yourself, schedule a demo.